Located in Chelsea Market, Eleni’s is like a boutique of baked goods, with beautiful displays and a clean, modern look. The treats themselves are just as beautifully presented and taste just as fantastic as they look. I’ve ordered their sugar cookies as gifts before and I can tell you from experience, they’re yummy and last a while (it took two weeks for our last batch to go stale, by which time there was only one more cookie). 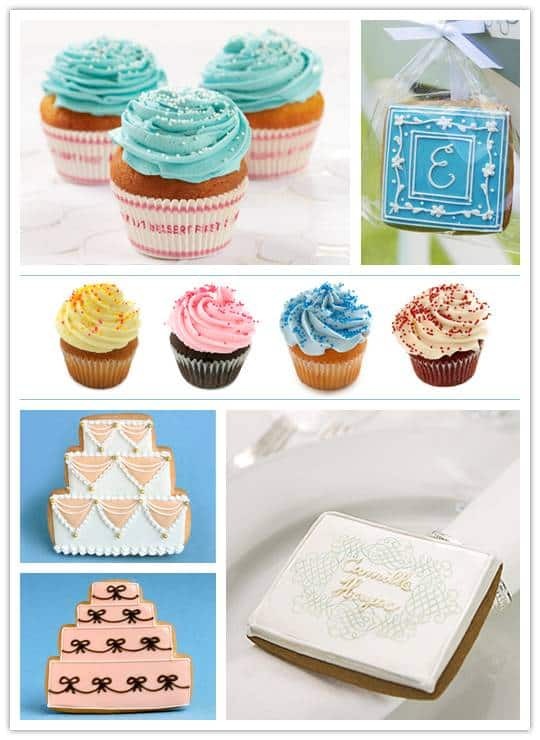 Eleni’s also does wedding favors that are absolutely adorable (check out the place card cookie favor in the bottom right hand corner! Two birds with one stone! ), but what I really would have given my right arm for were their cupcakes as my cake. There’s a whole long back story as to why I didn’t end up with them, but if you live in the New York Metro area, I highly suggest you try them out. Those look SOOOOO good! Yummy! I completely agree! I LOVE Eleni’s cupcakes – they are delicious and just the right size. And you don’t have to wait on a line that goes down the block.